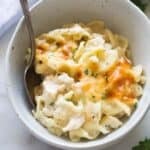 Comforting chicken noodle casserole with a simple homemade white sauce, cheese, chicken and egg noodles. 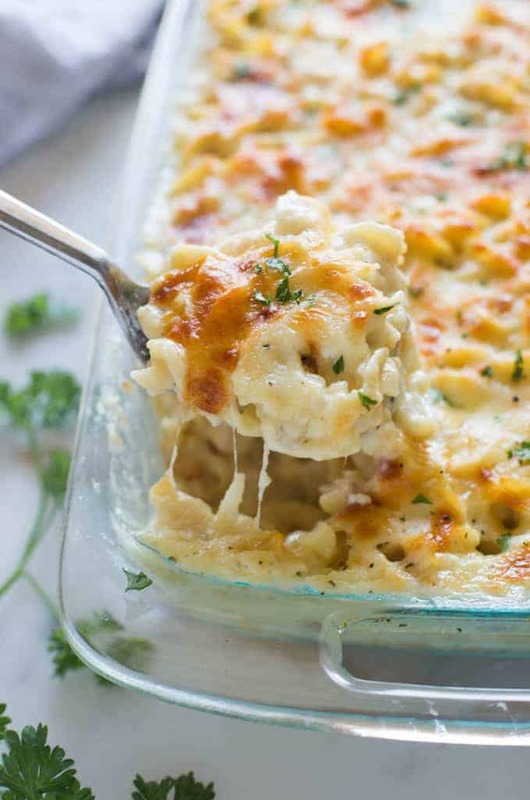 My family loves this creamy, cheesy, easy recipe! It’s that time of year where sometimes you just need a warm, simple, comforting dish that your family will love. 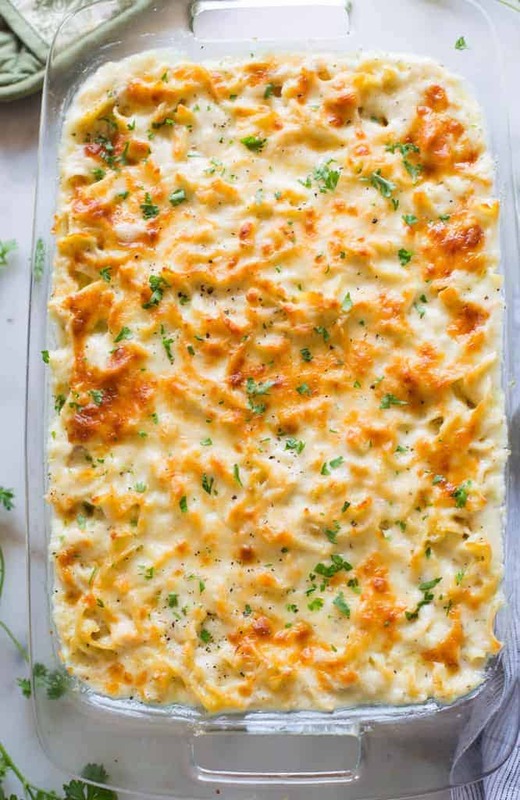 This chicken noodle casserole is the definition of comfort food! It starts with a homemade white sauce, using really basic ingredients you hopefully already have in your pantry: butter, flour, chicken broth, salt, pepper and dried basil. The sauce is a replacement for what most people would use cream of chicken soup for. It’s similar to my recipe for homemade cream of chicken soup, but this time it’s thickened with flour. When the sauce is thickened, you add it to a large mixing bowl with the remaining ingredients, chicken, noodles and cheese. The mixture is saucy, cheesy and delicious! Pour everything into a large casserole dish, at least 9×13”. Add a sprinkle of additional cheese on top and bake it until the cheese is golden and the mixture is bubbling at the edges. Allow it to cool for at 10-15 minutes before serving, to allow it some time to set. 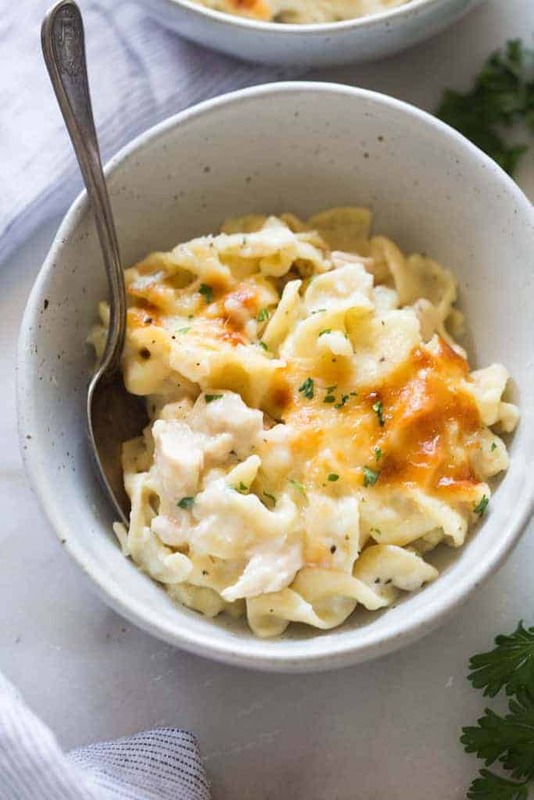 Comforting chicken noodle casserole with a simple homemade white sauce, cheese, chicken and egg noodles. Melt butter in a large saucepan over medium to medium high heat. Add flour, salt, pepper, garlic powder, dried basil. Cook, stirring, for 1-2 minutes. Slowly whisk in chicken broth, about a cup at a time, until mixture is thickened, about 5-10 minutes. In a large mixing bowl stir together cottage cheese, egg, 1 cup of mozzarella cheese, and 1/2 cup parmesan cheese. Add mixture from the stovetop. Fold in cooked chicken and noodles. Taste and add additional salt, pepper or dried basil, if needed. Pour mixture into a 9x13’’ baking dish. Top with remaining mozzarella and parmesan cheese. Bake, uncovered, for 30-40 minutes or until golden on top and bubbly. You can make this recipe up to 24 hours ahead of time. Assemble, cover tightly with foil and refrigerate. Bake as directed, but you may need to add 10-15 minutes to the baking time. Only boil noodles for 5 minutes. Assemble and bake according to directions, and allow to cool. Cover really well with a double layer of aluminum foil and freeze for up to 2 months. When ready to eat, bake from frozen for 1 1/2 hours (still covered with foil.) Then uncover and bake for another 20-40 minutes or so, or until it's hot and bubbly. Made some slight changes but was a hit. Very easy to make and assemble. I really liked the fact I can freeze for a later time & pop in the oven. I made more than enough to freeze for next time. Does it really take 24oz of cottage cheese? Question- the photo shows an orange cheese topping (almost like a cheddar), which is what enticed me. But in the video the casserole looks much whiter and wetter. Which is more accurate? Could you maybe make a cheddar version, instead of mozzarella and parmesan? Just wondering. Thanks. You could substitute cheddar for the mozzarella if you want. In the photos, the mozzarella and parmesan are golden from baking in the oven. This was delicious, I made it tonight and we loved it. I think next time I will add some more seasonings just to bump up the flavor a bit, but the texture was great. Just enough sauce and cheese to make it creamy and yummy. I think more herbs would be nice. Thanks for a great recipe, it does taste better from scratch. I followed this recipe exactly as written and found it’s everything a weeknight dinner should be -easy, without sacraficing flavor. Thanks for sharing this great recipe! Made this for my family (husband and 9 year old twins) and it was a mega hit!! Pretty easy to make using ingredients that you probably already have! Thanks for the delicious meal idea!